The world can be flat, concrete, and without movement. The imagination is what creates movement by conceptualizing a place called the Imaginal. Entrance into this space happens in and through the art. The Imaginal is a liminal space between reality and fantasy; a place where composition, technique, and intention are not facsimile but authentic. Each interpretation of the Imaginal is a dérive through a personalized, aesthetic landscape. Come experience the Imaginal where each narrative reconstructs what abstracted reality means in contemporary America. Caroline is a graduate from the School of the Art Institute of Chicago with a degree in Visual Critical Studies. Her areas of specialty are Copyright in Art, Gender Studies, and Modern Philosophy. 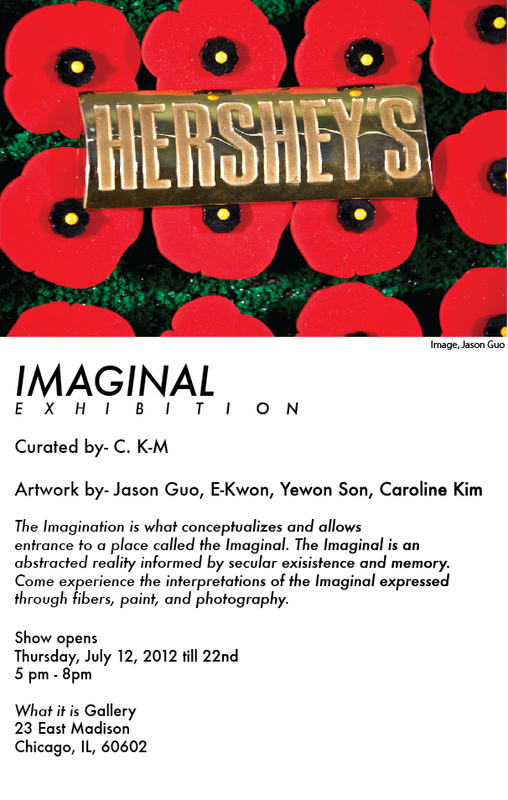 As a Korean-American woman, her past exhibitions have been curated in a multicultural and focused approach, . Fascinated by cartography and the spaces she occupies, Caroline finds meaning by retelling her experiences through her curatorial practices. In the Spring of 2012, she published “Copyright at Art School: Protecting Artists against Copyright Infringement” and lectured on Art Copyright at Art Institute of Chicago. She has also exhibited her paintings and photography at the Sullivan Galleries and the Regatta.